The expectations of last season were ultimately unmet by the Long Beach State men’s basketball team, but they are looking to get back on track this year with fresh faces. Any hope of back-to-back NCAA tournament appearances was shot down when UC Irvine eliminated top-seeded LBSU in the second round of the Big West Conference tournament last March. This defeat, combined with a blowout loss to Baylor in the first round of the National Invitational Tournament, ended the season on a sour note for the 49ers. There’s still reason to be hopeful as the team is bringing forth a mixture of new talent and experienced players for the upcoming campaign under head coach Dan Monson. Among the veterans of LBSU is junior guard Mike Caffey, who started all 33 games last season. In those games, he posted averages of 12 points, four rebounds, and 1.4 steals, which helped him earn First-Team All-Big West honors. For this upcoming season, Caffey is looking to put himself in a position to win Big West Conference Player of the Year and reach the NCAA tournament again. Amongst the familiar names on the roster, there are even more unfamiliar ones. Of the 15 players in the 49ers this year, only seven of them were on the team last season with the remaining eight consisting of two freshmen and six transfers. “We got a lot of good guys coming in too, so I’m looking forward to start playing with them to get our chemistry right,” Caffey added. Last season’s schedule for LBSU featured top-notch programs such as Ohio State, Syracuse, and even a home game against North Carolina. The field of competition for this year won’t be a walk in the park either, with household names like Michigan, Kansas State, and Arizona State on the schedule. While an upset win over any of those major programs would tremendously boost the 49ers’ confidence, the main focus remains on the local opponents in the Big West Conference. The LBSU team will almost certainly have to win the Big West Conference tournament in order to clinch their second NCAA tournament berth in three years. This is not out of the question for the 49ers, who have also claimed the regular season Big West Conference championship in three consecutive seasons. However, with no player like Casper Ware or James Ennis, they may have to turn to a more collective effort from players like Caffey, as well as other key returners Dan Jennings and Kris Gulley. Jennings, a senior transfer from West Virginia University, has the physical tools to be a dominant big man but has plenty of room for improvement in his free throw shooting. At the charity stripe last season, Jennings only managed to sink a paltry 46.3 percent of his foul shots. What makes Jennings a potential emerging star, though, is his strong play near the basket where he uses his 6-foot-9, 255-pound frame to bully opposing players. The synergy of Jennings’ size and tenacious play style allowed him to average a solid 8.4 points and 6.4 rebounds per game last season as well. After serving mostly as a bench scorer last season, Gulley may be promoted to full time starter, replacing the departed Ennis. Gulley possesses many of the same physical qualities that made Ennis so successful as the 49ers’ swingman, in addition to a solid shooting stroke from the perimeter. One possible impact player flying under the radar is sophomore Branford Jones, who had his season cut short by a leg injury the first game of last season. This year he’s looking to pick up where he left off. “I see myself in the same role as last year, before I got hurt... backing up Mike [Caffey] and doing whatever it takes to help the team out on the court,” Jones said. A strong team-oriented effort may be what it takes for the 49ers to survive in the early part of this year where they will be tested early and often. It won’t be a simple or quick process for the team to adapt to the changes from last season, but the potential on this roster should give Coach Monson plenty to experiment. 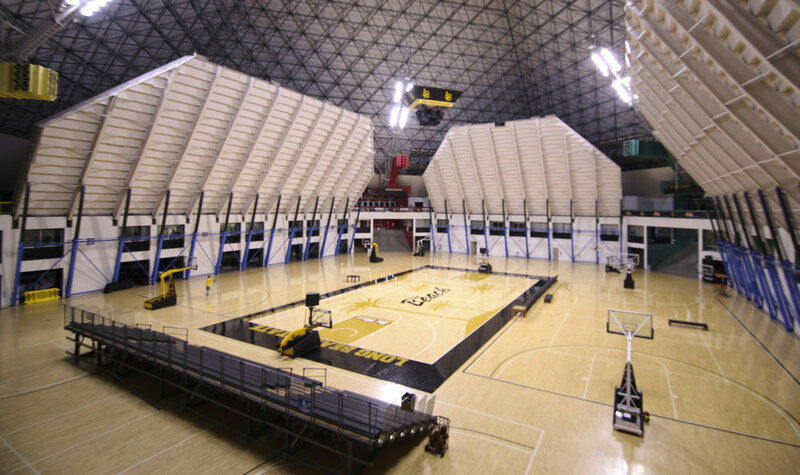 Long Beach State will tip-off the season with its homecoming game Nov. 9 against Hawaii Pacific University.